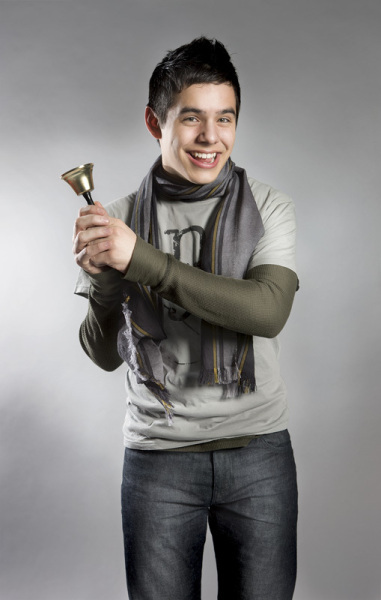 Carol of the Bells David Archuleta fans have started celebrating Christmas early this year. With his debut Christmas album, David shares his love of Christmas with us. This holiday CD features his voice at its pure, soulful best. We fans have the opportunity to show David how much we love his music. If you haven’t already done so, order several copies of Christmas from the Heart now to stuff into all your favorite stockings. David has announced a multi-city holiday tour starting November 24 in Salt Lake City and ending on December 20 in Westbury, New York. Find out if he’ll be coming to a city near you. David’s Christmas from the Heart is sure to bring joyous music to our hearts throughout the holiday season. For once I am happy to be ringing in the holiday season very early this year. It’s such a joyful time to celebrate and David’s holiday album and tour will make it so memorable. I hope he will enjoy the tour as much as we’ll enjoy it! If not MORE!! This picture of David ringing in the Holiday Season and his new album Christmas From The Heart gets me in the mood for David’s upcoming concerts. Can’t wait to see his sweaters and all those marvelous scarfs!